While I personally believe I stop one step short of a crazy cat lady, I do love cats. A lot. Especially in slice of life anime. So, when I discovered there was an anime about a writer adopting a cat, and their lives together, I was pretty stoked. Called “My Roommate is a Cat” in English, and in Japan “Doukyonin wa Hiza, Tokidoki, Atama no Ue” (which translates to My Housemate Is on My Lap, But Sometimes, on My Head), this is a story of two lonely souls, a stray cat named Haru, and a human named Subaru Mikazuki, who begin to heal when they find each other. The story opens with the death of Subaru Mikazuki’s parents who have passed away in a bus accident, while on a trip. Subaru just wants to be left alone to read his books. With his parent’s death he believes this is possible. Fast forward several years, and he feels no closer to the peace and quiet he wants, even though he has just about cut himself off from the outside world. He is alone, with the exception of his editor, and his neighbor, both of whom he considers a nuisance. He has also become an established writer, but, when the story opens, he is at a loss to what his new book should be about. On a visit to his parent’s grave, he finds a hungry cat that gives him an idea for a story and takes her home with him. 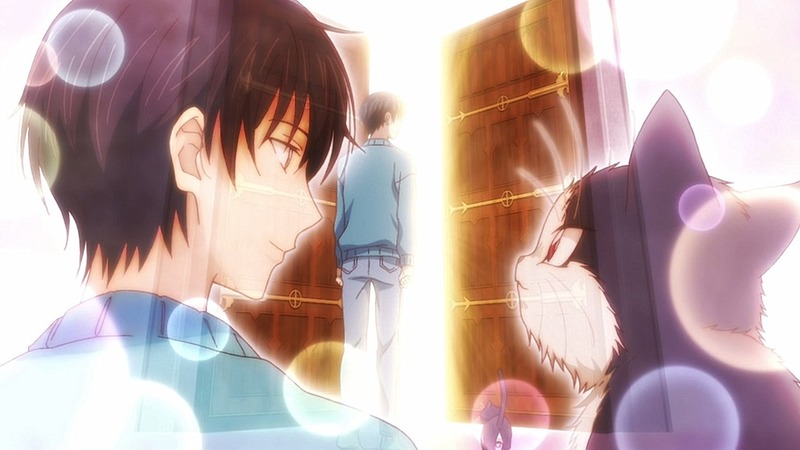 One of the unique aspects of the story is not only do we see it from the perspective of Subaru, but we also see it from the cat’s view—who by the second episode is named Haru. We discover Haru has lived a hard life. She’s the only one from her litter to survive, and most of her life has been filled with hunger. She’s slow to trust, and initially only plans to stay with Subaru for a short time to repay him for feeding her. They slowly begin to win each other over. Subaru is at first perplexed by behaviors that are normal to cat owners but strange to him. Haru is equally confused by Subaru. How much the one cares for the other begins to shine through despite their lack of understanding about the each other. An uneasy truce forms. This dynamic crescendos in a fantastic third episode, where Subaru is forced to confront his feelings of loss toward his parents. The execution of that episode is flawless, and it’s one I recommend going into as blind as possible. The series deals with some pretty heavy stuff, but it swings between that and some very amusing, light-hearted moments. One of my favorites in the first three episodes is when Subaru goes out to buy some cat food for Haru having no clue what he’s doing. The flipping between tones feels like it suits the series very well, and keeps things from getting too heavy. The hardest part of getting into the series is the character of Subaru. He’s selfish and hostile to every human who interacts with him, even though most characters try to help out of concern for him (which begs the question of why they bother?). It’s painful to watch and makes getting through the first half of the first episode a little difficult. The idea of the show is both of them come out of their shells and learn to trust others. For that, Subaru has to start from square one. Having not seen beyond the third episode, I’m concerned where the series will go from here. The third episode is so well done; it’s hard to see how the series will top itself, though I have some ideas. I wouldn’t be surprised if the climax of the series involves Haru escaping from the house, and Subaru realizing how much she means to him as he tries to find her. Overall, I recommend this series, especially if you like healing stories or just like cats. It’s a solid addition to the anime world, and while it’s unlikely to stick out in my mind a few years from now, it’s perfect for what I want from an anime right now.